I often have the privilege of speaking into the lives of the young men around me who are hoping and praying that God brings a wife to them soon. This hope and desire can be confusing and often selfishly motivated but it presents a fantastic moment in our lives to learn a great deal about ourselves; things many men never learn. If a man is in deep pursuit of God I know that God is building into this man at all times. He is creating a man of God, a warrior, a champion who will be willing to lay his life down for his princess and family. If we allow God to work on us there will be a time that you will not recognize yourself if you could stand in front of your past self. A big part of that re-creation and re-structure is our willingness to be re-created. A willingness to stand aside in humility and offer ourselves to the process. You must lay yourself down, to the side, so that God is then free to bring the abundance on. Think about that verse in Malachi (Malachi 3:10), “Test me! Tithe…give…lay your self down…put your control aside…and give it to Me. Bring in the entire tithe. See if I won’t bless you in crazy ways; overwhelming ways.” When you are ready to lay yourself aside, God then is ‘free’ to give to you that which is ‘fragile.’ Like leadership, or vision, or creativity, or the lost, or…a woman. He is free to give you those things that you have the capability to ruin, to destroy, to abuse, to kill. The ultimate in a man’s life is his sexuality. When you have given that over to God and he can count on you not to destroy the fragile flower of a Godly woman….you are then ready to receive that great gift. So, “Are you ready? If God brought a woman into your life do you have the strength to protect her? Protect her trust, her body, her faith, her intimacy?” That is the question that you must answer. If you are asking yourself this I truly believe you are on the precipice of an amazing discovery in your life. Sadly we decide the pain of being created in God’s likeness and being prepared to receive the fragile gift is much too hard to we take matters into our own hands. We go find for ourselves someone who we can put up with. But because we didn’t do the hard thing up front, the hard thing will be lived out with much pain in the future. As I put the finishing touches on the Tree Fort it became pretty evident that the fort would be highly used by all the boys, regardless of the age. In fact the 17 year old friends of our oldest are giving it rave reviews as they mount their airsoft guns on the window sills. 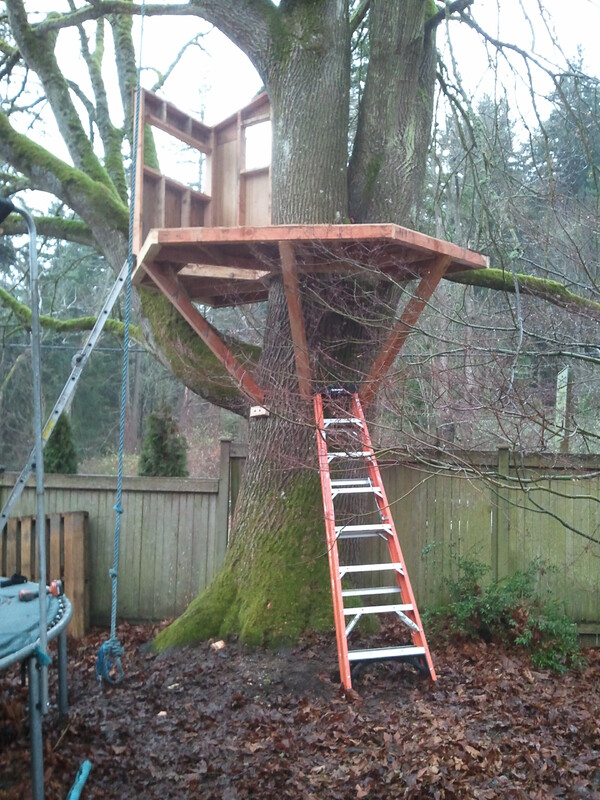 I already have plans for the “crows nest” that we will build on the next school break, just ten feet higher in the limbs of our big old cedar tree. 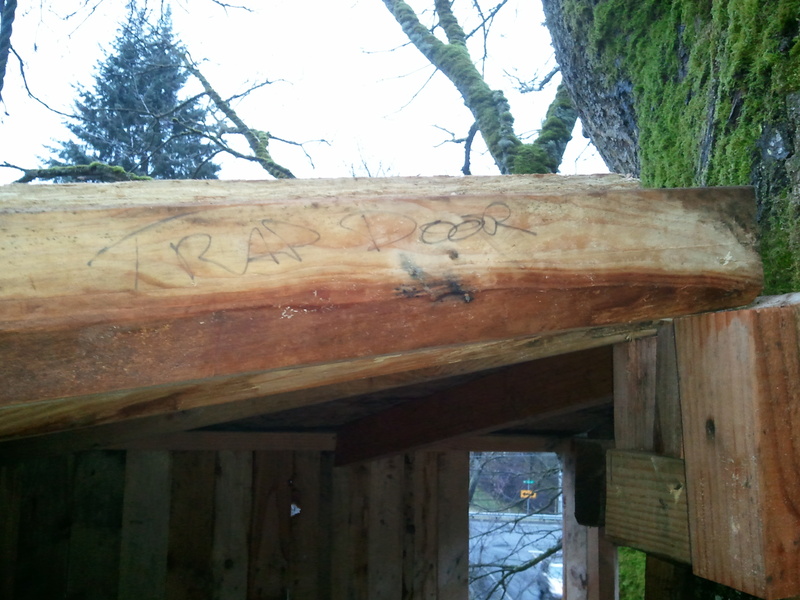 All good tree forts need a trap door and rope ladder and even more important – a way to pull the ladder up and lock the trap door once the defenders of the fort have retreated into the high rise protection. 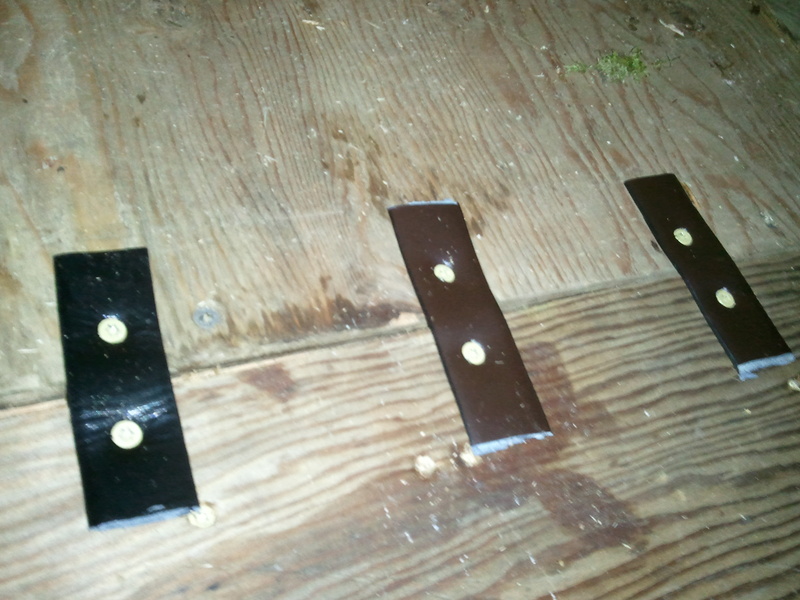 A trap door is a necessity to holding up for weeks on end against the invaders from the south. 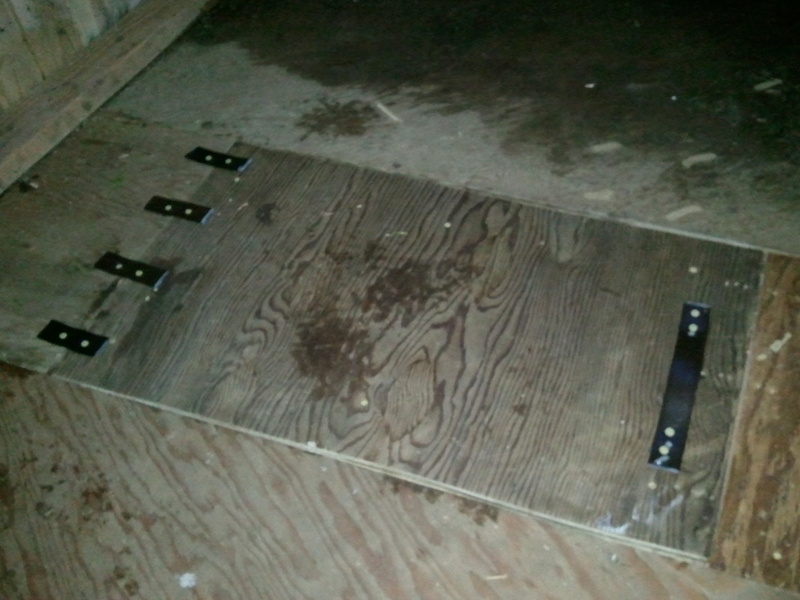 And, of course, any door that is called a trap door is just plain cool. So I made two. 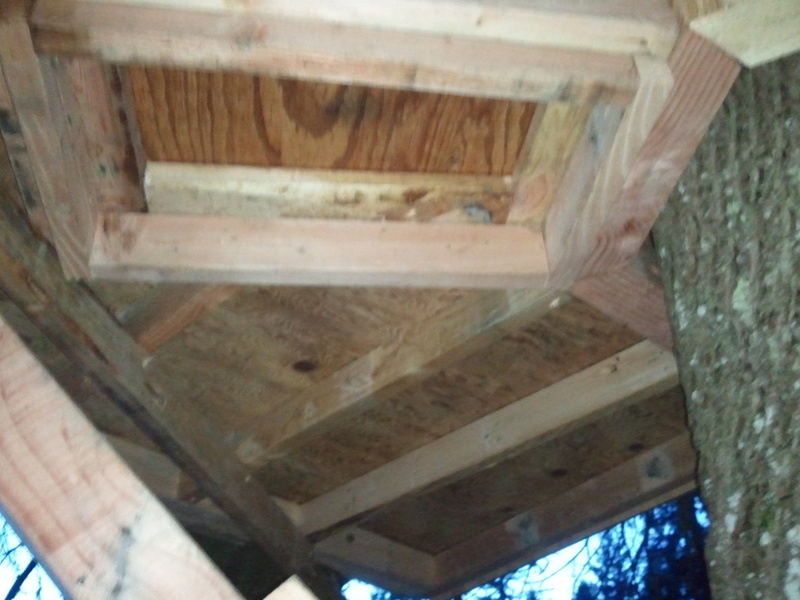 All good trap doors need to sturdy and since this one is right in the middle of the floor of the tree fort it has to be constructed in such a way that a 190 lb boy can jump on it when they are playing with the 50 lb boys. 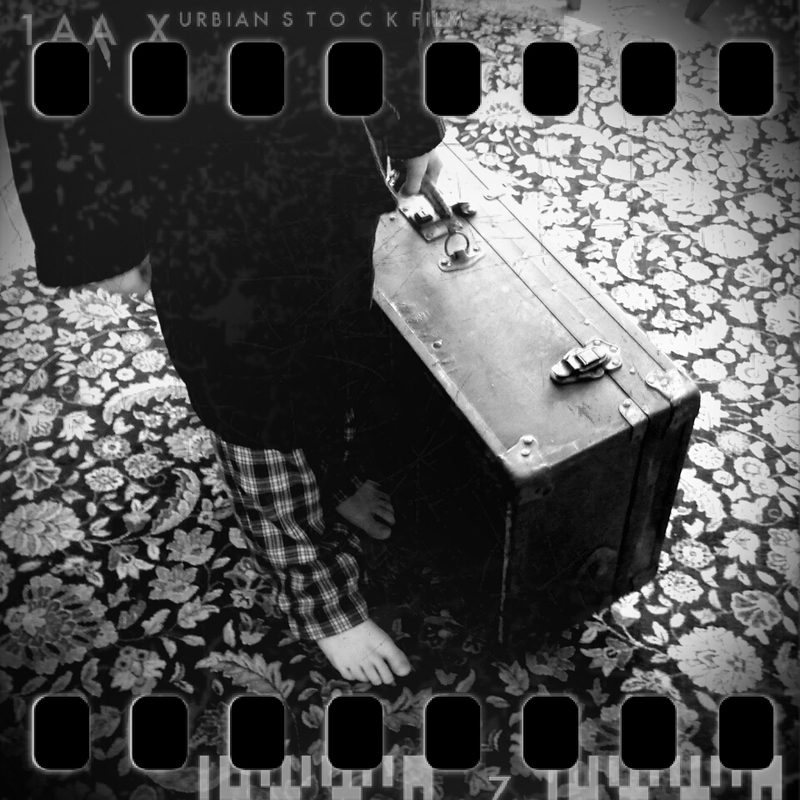 Actually, when it comes to tree fort etiquette, “the person or person’s playing can act any age they want without reprimand…but preferably the age of the youngest person in the fort.” Hence, a trap door must hold up the weight of, not only the lightest boys, but also the heaviest boys. I have been on a quest to not spend any money on this fort, save fasteners. So when it came to making hinges and a handle for the illustrious trap door, I, being of frugal mind, and not having any hinges or handles at my disposal decided to sleep on it. 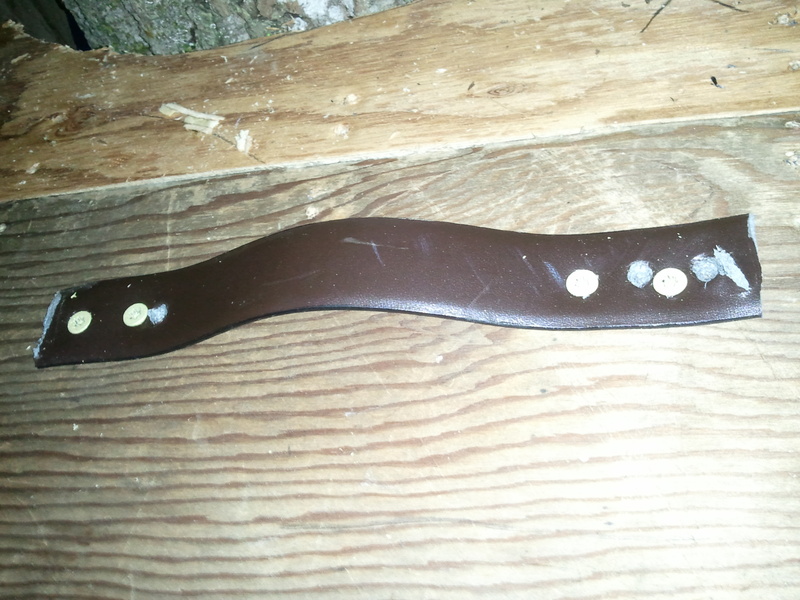 And sure enough in my dreams I came up with a solution…my old leather belt needs to be reassigned. And…I was giddy with accomplishment and frugality. Talking about trap doors though. I wonder how often we keep a trap door accessible in our lives. 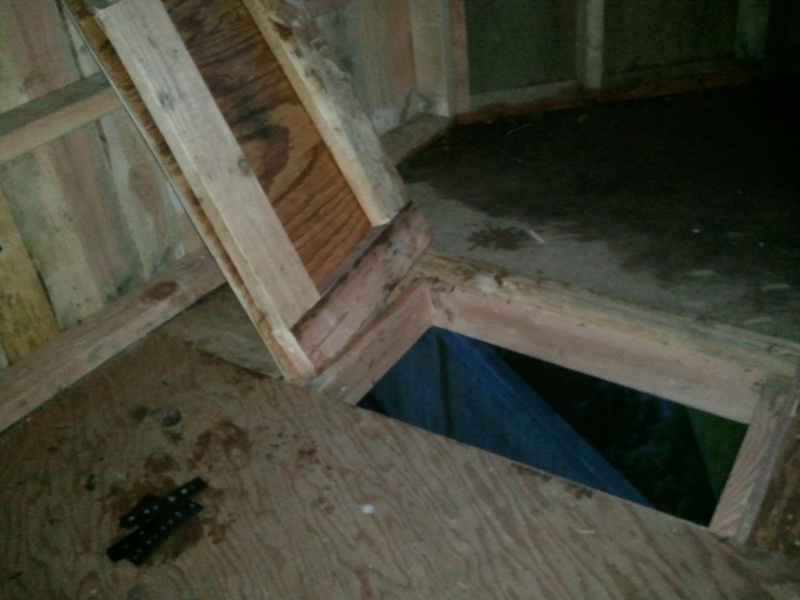 The trap door can let people in or keep people out…its really up to us. As we live in our little tree fort lives we look out that window at the person approaching the tree across the backyard and within an instant we have calculated if that person is worthy of us bending over, taking hold of that leather handle and pulling the door open to welcome the person in…or not. Some times we walk right over to that door and stand right on top of it. Who are we to make such decisions? What’s crazy is the way we so desire to let those people in whom are the ‘popular’ ones and who, frankly, are the very ones who will not let us in. But we turn so quickly and judgingly keep those who would love to be our tree fort friends, out. “Open your door to strangers.” Is what Jesus said. 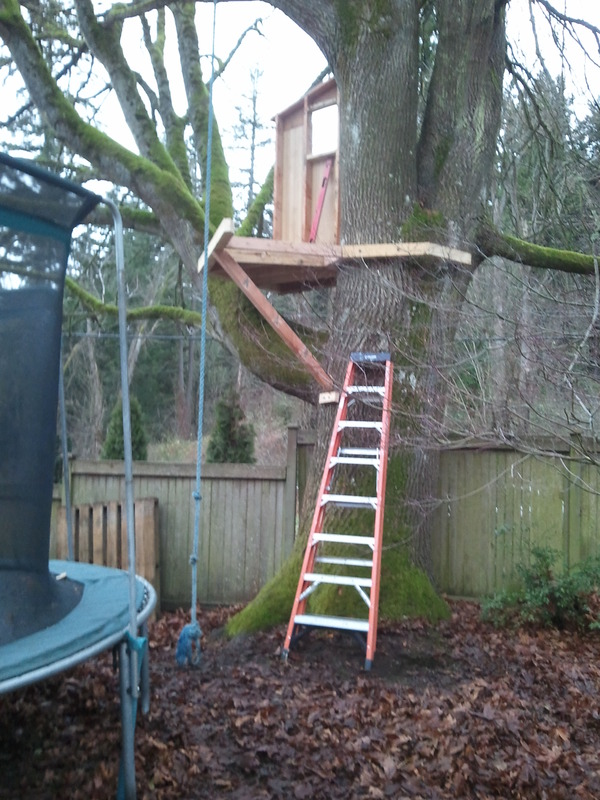 Building a tree fort for four boys is a very important act of Fatherhood. I have heard, “You’re a genius!” spoken in my direction from my offspring more in the past couple of days than I have the entire 17 years of this parenting journey so far. Many of our years of parenting have reflected something my sister-in-law posted on Facebook this morning. “My daughter is like green tea. She draws out my toxins and impurities. Then rubs them in my face.” Thank you Erin, that about sums things up. But having my oldest two attest to my genius-like attributes makes holding the baby worth the birthing process. Building a tree fort is kind of like building a family. At times I really am not sure I know what the heck I’m doing and then all of the sudden things look alright, only to be lead into long moments of bewilderment and complete confusion. One of the hardest moments so far in the construction of this elevated fort of awesomeness comes with a bit of irony as I drive huge lag bolts through the bark and into the woody trunk to hold pieces of it’s cousin onto its side. The human cut and planed boards being attached to a living tree holds a whole sermon in thought but will probably never be preached. 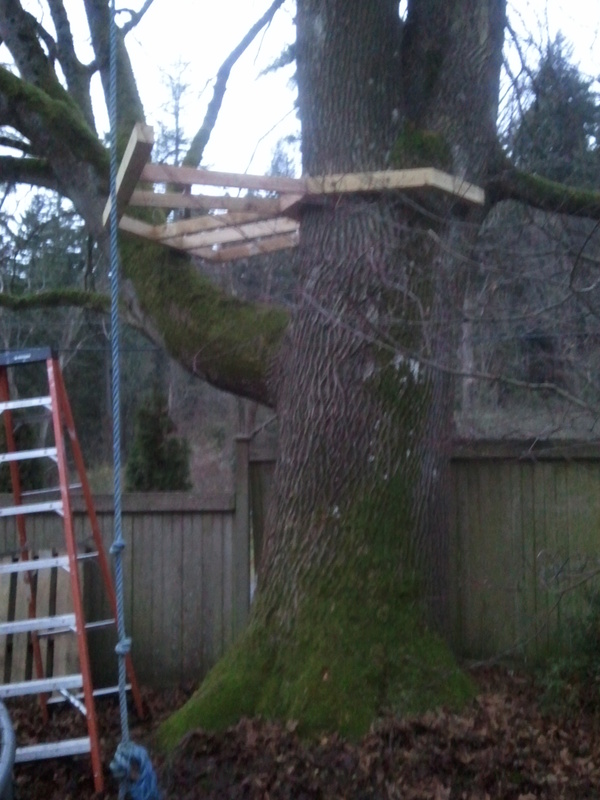 The tough part is making these boards level so the tree fort can hold some resemblance of a highly crafted structure. Piece by piece leveling the floor. With only one branch to build upon and the great desire to have a fort that enjoys 180 deg. view it began quite difficult to keep things level, not to mention the difficulty of building the platform frame with no supports. But with a little help from a couple of strong young men, a four by four brace and a four foot level it finally started to take the resemblance of sketches floating in my head. Once we figured out how to build the first section of the base the next few became easier. Then screwing down the floor and building another wall was as easy as making nice MLT: a mutton, lettuce and tomato sandwich, where the mutton is nice and lean and the tomato is ripe. They’re so perky, I love that. Kind of like living, isn’t it? Those foundations are so hard to build but when they are built so much can happen and so quickly. Problem is, so many of us decide the foundation building is just too hard, so like pansies, we give up and go right to building the structure without the foundation. We think all the glory is in the structure – no one ever notices the foundations – everyone sees the structure. My foundation for the fort was in place long before I fastened the first plank to it’s uncle, Mr. Cedar Tree. I actually learned how to build from my dad, then from school, then from a company that built barns, then from my own construction business I ran for several years. All of that gave me the ability and confidence to place a firm foundation so the structure can be good looking and safe. Don’t cheat foundation building. Give it time and enjoy it. Work at it. It will always pay off. These times of struggle and hardship are what glorious tree forts are built upon. Come on gimme a shout! I’ll get a new wife! The bank will preserve it. Cause it is up to par! And I’ll be there with my money. The Prez will make the call. I’m only just a man. He was shinin through the haze. And did a hard thing? And let the Master sing? It was a typical day at the local community college Campus Crusade for Christ club meeting, a group that has double in size since the beginning of the year, but when doubling means adding only thirteen new students it’s still quite easy to recognize those who wonder in who are a bit out of place. A bit out of place was the perfect description of a young man who walked in just a minute late. He found a chair and sat down with his head slightly lowered, trying to not draw attention to himself. After a slightly awkward “ice-breaking” game the conversation quickly turned to the topic we all came to discover and discuss. As words were exchanged back and forth across the room like a game of tennis between two seven year olds, my attention was turned towards the exposed arms and neck of the “slightly out of place” young man. Flowing fonts in your typical tattoo green spelled words that I couldn’t quite decipher. Maybe they were written in a different language, maybe I couldn’t read upside down. When my eyes moved from his skin art to his eyes it dawned on me that he not only looked out of place but felt out of place. At times throughout the conversations his down cast eyes would fill with tears, but never did they run over. Soon the hour club meeting of CRU drew to an end and I made a point of getting myself in front of the this tattooed, muscular, bald man. We chatted a bit about him being at the college to get his GED and then to get a practical job that will help him care for his wife and three children. “Three children?” Was my thought. At 25 years of age he has quite a family. Soon his conversation turned to his wife of seven years and their extremely rocky marriage, his being in and out of jail, and about his restraining order, which didn’t allow him to see his wife or children. I remained intune and concerned for this young man, who was feeling remarkably comfortable sharing his story to a complete stranger. Then he told me that he is very concerned for his wife, whom he really loves. “Why are you so concerned?” I asked. “She is pregnant and going to have an abortion.” He replied. He looked at me, not knowing what to say. Giving him my cell number and email, I asked, if not begged him to call me later that day and then encouraged him and his wife to break his restraining order and come to our home together and talk. He had to run to a class. I put my hand on his thick frame and prayed a prayer of protection and wisdom on him. Later that day his wife called me and as she told me her name I recognized it as the cursively fonted tattoo on the back of the young man’s neck. I was ecstatic that she took that gamble. We made an appointment for that Saturday morning with both of them at our home. Saturday, May 2nd, 2009, 10:30 am rolled around and they drove up, and walked across our lawn and into our living room. For the next 3-1/2 hours we listened to their story, the journey that they have found themselves fighting for life through. Patiently they both shared their side of the story. Then Kristine and I poured into them. We loved them, affirmed them, encouraged them, counseled them, and shared the love of the Holy Father with them. Their faces showed the transformation that only the Holy Spirit can bring to a person. At 2 pm, after a prayer of grace, they rose from our couch a new couple. They will continue to have pain and struggle through the coming months, but they have agreed to meet with us and start on a different journey, one of healing and re-creation. She had an appointment at 1 pm that same day at the abortion clinic, but she walked out of our home at 2 pm with hope and a new found desire to raise their new baby. This child will change the world! We are seriously in the business of saving lives and God allowed us to have a first hand experience that saved the life of an unborn child and the lives of a man and woman and their other three children. This family has a long road of healing ahead of them but God is going to use them and their stories in ways they can’t even imagine as they share with others and are part of saving lives themselves. Thanks be to the Great Life Saver! Brandon and I left Winona, MN Sunday night for a quick slip into Seattle and back out before our families could miss us. The four days would pass quickly, so we knew that we would need to be extremely efficient and get right to work when we got there, no playing around, no golf, no joy rides up into the mountains, no sailboats on the Sound, just work. The work started before we left. Before we grabbed a couch and cot at Mark Paulson’s house in Minneapolis we had to type and send the text for the Seattle Church Plant Brochure that Shelli Daniels needed to finish by noon of the next day. By 2 am we got the info shot off to her, and we crash, only to crack the lids open at 5:30 am. The plane was leaving at 7:20 am. Three and a half hours of uneventful air travel brought us over the Cascade mountains. 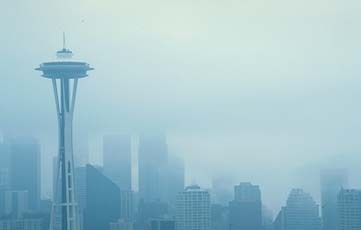 With just a quick glympse of Mount Rainier we dove into the fog covering the city of Seattle and touched down at Sea-Tac, me with an aching neck from wobbling back and forth as I went in and out of consciousness. After renting a car, a lame Dodge Charger, we headed off towards the city center to walk and pray. We wanted to have some time to feel the city, to smell it, to taste it. We wanted to get some understanding of the people of Seattle, maybe just watch them, maybe chat with them. I have been to Seattle before but just as a tourist. This was so much different; we were there to find an environment in which to be the hands and feet of Christ. We were there to discover.